Fun, simple, delicious. Sounds good, right? Pretzels! Why not? 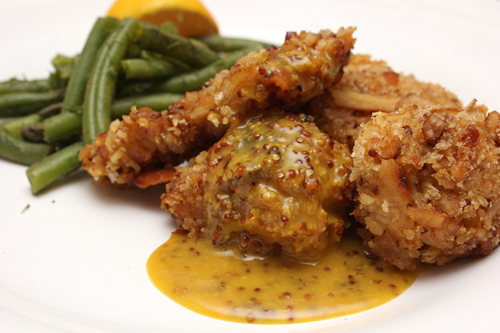 The recipe for “Pretzel-Crusted Chicken with Honey Mustard,” from the February 2015 issue of Cuisine at Home (recipe below), is measured perfectly. The portions -- of flour dredge, of honey mustard, of pretzel/panko -- accurately satisfy the needs of coating the chicken. Mix together flour, paprika, and pepper in a shallow dish. Whisk together whole-grain and yellow mustards, honey, lemon juice, and garlic. Reserve half the honey mustard; transfer remaining half to another shallow dish. Crush pretzels in a resealable plastic bag with a rolling pin; combine with panko in a third shallow dish. Dredge chicken fingers in flour mixture, dip in honey mustard, then coat in pretzel mixture. Heat oil in an ovenproof skillet over medium until it shimmers. Cook chicken on one side until brown and crispy, 5 minutes. Flip chicken, transfer skillet to the oven, and bake for 12 to 13 minutes. Tent chicken with foil; let rest 5 minutes. Serve chicken with reserved honey mustard and lemon wedges. The honey mustard is wonderfully appealing. It coats the chicken and makes is sweet. I also made the “Caper-Dill Green Beans,” from the same February 2015 issue of Cuisine at Home (recipe below). The “crisp-tender” stringbeans were great (and easy! ), in combination with the chicken. Arrange beans in a steamer pan set over boiling water. Steam beans, covered, until crisp-tender, 8 minutes; transfer to a bowl. Toss beans with capers and dill; season with salt and pepper. Next time, I will delve into the January/February 2015 issue of Cook’s Illustrated to make the “Drunken Beans” and the “Savory Corn Muffins with Cheddar & Scallions” (recipes below). I’m talking about tequila and beer. Come back to my site next week, to see what happens. Dissolve 3 Tbsp. salt in 4 qts. cold water in large bowl or container. Add beans and soak at room temperature for at least 8 hours or up to 24 hours. Drain and rinse well. Adjust oven rack to lower-middle position and heat oven to 275 degrees F. Pick leaves from 20 cilantro sprigs (reserve stems), chop fine, and refrigerate until needed. Using kitchen twine, tie remaining 10 cilantro sprigs and reserved stems into bundle. Cook bacon in Dutch oven over medium heat, stirring occasionally, until crisp, 5 to 8 minutes. Using slotted spoon, transfer bacon to paper towel–lined bowl and set aside. Add onion, poblanos, and garlic to fat in pot and cook, stirring frequently, until vegetables are softened, 6 to 7 minutes. Remove from heat. Add tequila. Return to heat and cook until evaporated, 3 to 4 minutes. Increase heat to high; stir in 3 1/2 cups water, bay laves, 1 tsp. salt, beans, and cilantro bundle; and bring to boil. Cover, transfer to oven, and cook until beans are just soft, 45 to 60 minutes. Remove pot from oven. Discard bay leaves and cilantro bundle. Stir in beer and tomato paste and bring to simmer over medium-low heat. Simmer vigorously, stirring frequently, until liquid is thick and beans are fully tender, about 30 minutes. Season with salt to taste. Serve, passing chopped cilantro, lime wedges, Cotija, and reserved bacon separately. Adjust oven rack to upper-middle position and heat oven to 425 degrees F. Grease 6-cup muffin tin. Whisk 3/4 cup cornmeal, flour, baking powder, baking soda, salt, pepper, dry mustard, and smoked paprika together in medium bowl. Combine milk and remaining 1/4 cup cornmeal in large bowl. Microwave milk-cornmeal mixture for 1 1/2 minutes. Whisk thoroughly and continue to microwave, whisking every 30 seconds, until thickened to batter-like consistency (whisk will leave channel in bottom of bowl that slowly fills in), 1 to 3 minutes longer. Whisk in sour cream, melted butter, and sugar until combined. Whisk in egg, cheddar cheese, and scallions until combined. Fold in flour mixture until thoroughly combined. Using portion scoop or large spoon, divide batter evenly among prepared muffin cups (about 1/2 cup batter per cup; batter will mound slightly above rim). Bake until tops are golden brown and toothpick inserted in center comes out clean, 13 to 17 minutes, rotating muffin tin halfway through baking. Let muffins cool in muffin tin on wire rack for 5 minutes. Remove muffins from muffin tin and let cool 5 minutes longer. Serve warm. Problems with registering? Please read this page. © 2019 Camille Cooks. All Rights Reserved.